When trying to provide effective counseling to patients regarding their weight goals, it has become clear to clinicians that it involves more than simply advising patients against excessive food intake and sedentary habits. Perhaps a critical aspect that has often been overlooked is the evaluation of eating environments and how they contribute to poor food choices. For instance, in one observational study, researchers evaluated the eating habits of 213 obese and normal weight non-Asian patrons in an all-you-can-eat Chinese buffet restaurant. Their findings revealed that obese diners made their food more visible and convenient by sitting closer to and facing the food while using larger plates. On the other hand, normal weight patrons were more likely to use chopsticks than cutlery. They also scoped out food options prior to making decisions instead of immediately grabbing a plate and filling it. 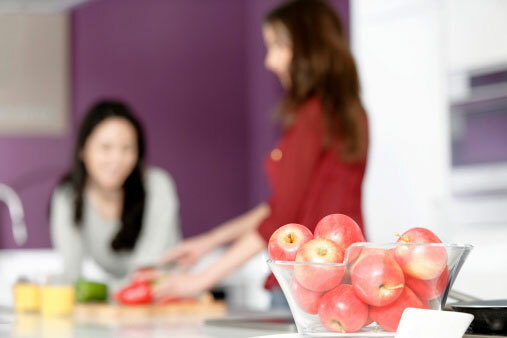 Understanding eating behaviors and influencing factors surrounding food choices can have a huge impact on how one should address the health concerns of an individual’s weight status. Unfortunately, limited research has focused on the influence of food choices within a home environment. Since the majority of food consumed is from within the home, researchers from Cornell University evaluated home environments, specifically people’s kitchens and countertops to determine contrasting features occurring between normal weight and obese individuals. The researchers performed two studies aimed to identify associations between characteristics of kitchen spaces, such as foods found on countertops, and how these differentiate between normal weight and obese individuals. Further, they investigated how these associations differed between males and females. The first study surveyed a national sample of 481 women online inquiring about their household environments. They were asked about appliances present on counters such as toasters, blenders, and food processors. There were also questions regarding specific food items like cookies, candy, packaged foods, and fruit bowls. There was no mention of any focus on weight but participants were requested to report both them and their spouse’s weight and height. Findings revealed that among both genders, a fruit bowl on the counter was associated with lower weight status. Packaged food items were associated with a higher body mass index (BMI), albeit only significant among women. Whereas, having cookies in plain view or even a toaster on the counter was associated with a higher BMI among men. The second study included 210 households of men and women with at least one child. Trained researchers took the measurements of all participants and conducted their own kitchen counter inventories to gain more comprehensive and objective information regarding household kitchen environments. To gain behavior perspective, researchers asked participants if they regularly purchased large-sized food packages and if they had a designated snack cupboard. Their findings revealed that normal weight individuals were more likely to have fresh fruit and less likely to have regular soda visible compared to obese individuals. Among men, visible cookies and baked treats were associated with increased weight status. Furthermore, for women, having regular or diet soda and breakfast cereal on countertops was associated with increased weight but having candy visible was associated with decreased weight; however, with men, easy access to candy was associated with increased weight. When it came to behaviors, normal weight women were more likely to have a cupboard designated for snack items and were less likely to buy large-sized packaged food compared to their obese counterparts. This research provides insight into differing behaviors among obese and normal weight individuals. These are easy changes to make that could decrease your daily consumption and make you more aware of your eating habits. More importantly, though, don’t just focus on deciding where to store your food; focus on your decision as to whether you should be bring it into your house in the first place. “The 20 lb. cereal box: Kitchen counter foods that relate to your weight,” ScienceDaily web site October 19, 2015; www.sciencedaily.com/releases/2015/10/151019130759.htm. Kaipainen, K., et al., “Slim by Design: Kitchen Counter Correlates of Obesity,” Health Education and Behavior 2015; doi: 10.1177/1090198115610571.